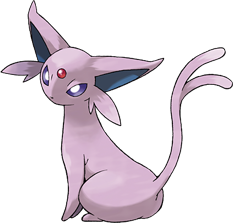 Espeon is the Psychic Eevee that evolves when happy in the sunlight. This is a huge difference from the stones used to evolve the first three, Flareon, Jolteon, and Vaporeon. That being said, when you finally evolve your Eevee, your Espeon will have the ability Synchronize, which will pass any status effect to your opponent. Your Espeon should have very high Special Attack, followed by good speed. We could give you defensive moves to pick, but Espeon should be a Psychic attacker. As always though, defense wise use moves such as: Power Swap, Morning Sun, Future Sight, and Sunny Day. Don't use all those moves together, pick and choose. Attacking wise, Espeon has a decent move pool. Look into attacks such as: Psychic, Dream Eater, Giga Impact, Psycho Shock, and Last Resort. Espeon is one of those really important Pokémon NOT to use all attack moves. Consider a solid mixture of attack/defense/status because an Espeon with all attack moves only isn't smart at all. Dear Espeon, we like you a lot, but more importantly, do our readers?